If you’ve recently installed a pool in your backyard or purchased a home that has a pool, you’re probably familiar with the term “pool shocking.” Shocking your pool is one type of pool maintenance that you’ll need to perform to keep your pool water clean. It’s crucial to understand why shocking a pool is important, how it works, and how often it should be done. What Does Pool Shock Do? Before you actually get started shocking your pool, let’s go over the basics of what pool shock really does. Pool shock is a fast acting cleaning method to kill algae that’s developed in your pool water. Most commonly done when you’re opening your pool for the season, but should also be considered after a big pool party or if you’ve missed a few rounds of basic cleaning. 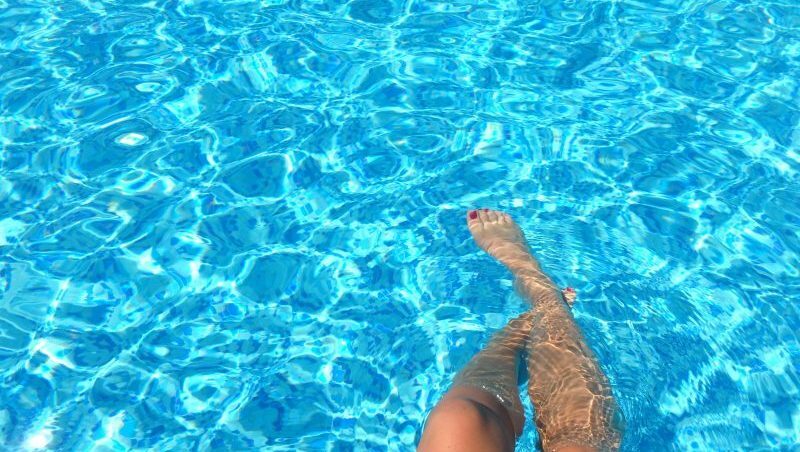 The infamous “chlorine” smell that you probably associate with pool water actually isn’t chlorine—it comes from chloramines. Chloramines are compounds in pools that are made up of a combination of chemicals and bacteria (like oils, dirt, and sweat) from swimmers. Chloramines build up in pool water when it isn’t properly maintained. So even though a whiff of pool water may bring back fond summer memories, the sharp smell you’re most used to actually isn’t a good sign. Enter pool shock. It’s no secret that properly maintaining your pool is a careful science, but we don’t have to get too technical to understand how pool shock works. When you shock your pool, you are essentially adding enough chlorine to break up the buildup of chloramines in the water. However, it’s important to note that you can’t shock your pool with regular chlorine tablets. While pool shock is usually made from chlorine, pool shock chemicals are much more highly concentrated. Proper shock treatments are designed to literally “shock” your pool and raise the chlorine level quickly. By shocking your pool, you effectively sanitize it. By proactively shocking your pool on a regular schedule, you can avoid cloudy pool water and algae altogether. The tricky part, of course, is determining what this “regular schedule” looks like for you. Blindly shocking your pool is never a good idea. Remember—the purpose of shocking is to break up chloramines in your pool water. So to determine when to shock your pool, you should test your water weekly during swimming season with chlorine test strips. Or you can bring a sample of your pool water in and let our experts test your water for you. Pay close attention to the chlorine levels in your pool. You should shock your pool when the combined chlorine level measures above 0.5 or when the free chlorine level of your pool measures zero. Shock your pool after opening it for the season to get rid of any algae or bacteria that could’ve built up in the offseason. When temperatures are too high, bacteria can grow more quickly. Plus, chlorine’s effectiveness is decreased when it’s too hot. To be safe, shock your pool after very hot and sunny weather. In South Carolina, this is pretty much the whole Summer! Since chloramines are formed partially due to bacteria from swimmers, it’s a good idea to shock your pool after a party or lots of recent activity. Remember, the “chlorine smell” in a pool is exacerbated by bacteria and contaminants. If your pool has a pungent smell, try shocking it to quickly increase the chlorine level and kill bacteria. The pool shocking process looks different depending on the type of pool shock you choose to use. And while you can’t typically shock your pool with regular chlorine tablets, there are plenty of shock products on the market to safely and effectively sanitize your pool. Pool shock products can be broken down into chlorinated versions and non-chlorinated versions. Also referred to an an oxidizer, non-chlorinated pool shock is made up of potassium salt and does not kill bacteria. If you’ve just had your big end-of-summer pool party blowout, this option might not be best for you. However, this type of shock helps clarify your pool water and work to reduce algae buildup. Non-chlorinated shock products also allow you to get back in the water quickly, without the 8 hour wait period chlorinated shock treatments require. Chlorinated pool shock is the most common shock product. It comes in many forms: calcium hypochlorite (cal hypo), lithium hypochlorite, and dichlor are just a few. All types of chlorinated pool shock must be used after dusk (remember, the sun will inhibit chlorine’s effectiveness). In addition, you must wait 8 hours before you are able to safely swim again. Many pool owners use a combination of non-chlorinated and chlorinated shocks. When used together, the non-chlorinated shock helps with water clarification, so the chlorinated shock can focus on killing bacteria. Whether you use chlorine free pool shock or not, the actual shocking process looks the same. Remember, chlorinated pool shock must be done at or after dusk and you must wait at least 8 hours before safely using your pool again. Put on your rubber gloves and protective eyewear to avoid any adverse chemical effects on your skin or in your eyes from the chlorine. Dissolve 1 pound of pool shock in the bucket per 10,000 gallons of pool water. Once the granules have dissolved, take the 5-gallon bucket around the perimeter of your pool and pour the shock directly into the pool while the pool is running. Let your pool run overnight and test the water again in the morning. If you have any questions or issues shocking your pool, feel free to stop by our storefront and let us help you out.